The Echinoblog: Author's Commentary on a New Scientific Paper! My newest paper-a big 22 page monster- that reviews the biodiversity and phylogeny of the Asteroidea (i.e., how many and the evolutionary history of starfish) was released today! Go click and see it! You know you want to! This was co-written with my colleague Dan Blake, Professor Emeritus at the University of Illinois at Champaign-Urbana. The paper is Open Access! which means that anyone should be able to go in and check it out for free! By coincidence I was looking at a TV show dvd set which of course, nowadays come with extras-commentary and so forth..
What kind of paper is this? A Review Paper! Materials & Methods-Outlines how the collection of data came about and how it can be reproduced. Parameters are explained and terms are defined. Results-The raw data explained with biases and etc. Discussion-An analysis of the data in the context of other research and what implications it has for the field. BUT every once in awhile, a scientist is asked to write what's known as a review paper. If everyone uses it, they know who you are. Useful if you are still making a name for yourself. Because there's no new data, you can write without having to explain methods or what-have you. Reviews can take a HUGE chunk of time when you could be doing something else.. There's no new data, so you aren't publishing anything "new" (although the narrative can be useful). So what did I learn about starfish from a "broad view"?? Colleague Jarrett Byrnes who writes "I'm a chordata! Urochordata" asked me in Tweet this morning what surprised me the most in this paper? So, let me summarize some neat factoids! There are some 1,890 species of starfishes. This is perhaps only exceeded among living echinoderms by the brittle stars for which there are over 2000 species (2,064)! What I thought was most interesting though, was that the great majority of those species, about 68% of them (1291/1890) actually live in cold-water settings such as the deep-sea, Antarctica, etc. with only a minority (about 11%) that live exclusively in tropical shallow-water regions, such as reefs and so on... with the remainder living in temperate water habitats. The most taxa overall? : Goniasteridae with 256 species in 65 genera. with 2nd place going to the Astropectinidae with 243 species in 26 genera. 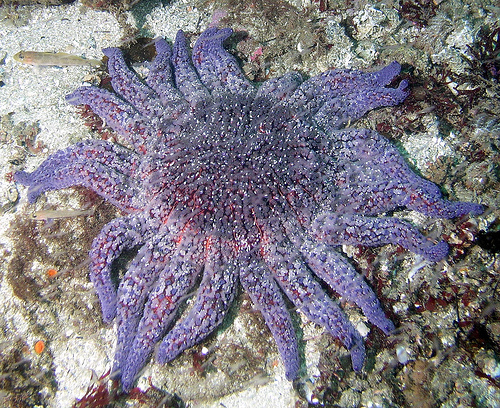 The ever-familiar Asteriidae, which includes familiar species such as Pisaster ochraceus and Pycnopodia helianthoides the sunflower star comes in 3rd with 178 species in 35 genera. So, What are ya' talkin' about? EXTRAS? Its a blog! Not a 5 disk collectors' set! The paper was part of a series intended to, in part, advertise the World Asteroidea Database and all of the other marine invertebrate species treated by the World Register of Marine Species (WoRMS for short). Basically, the database can track the year of description of each species which is then plotted over time. Not a lot at first but we start to pick up names in the 19th Century and REALLY start to pick up in the 20th Century during the heyday of prolific works such as Walter K. Fisher and Edmond Perrier! A second interesting graph plots the number of species described by various authors over the last 10 years or so.. I am ranked 4th-but am I really? Of the names on that list McKnight and Rowe are largely retired (and the papers counted below are for older names predating 2000). I get the impression that "Clark" is an amalgam of several different authors named Clark (for some reason echinoderm biology has a LOT of people named Clark)-so I will have to check-but it is probably artificially high, "O'Loughlin" works primarily on sea cucumbers these days.